and entered the strong chess club in Moscow. He won his first tournament 1908 at the chess club, aged 16 years. His father was wealthy and this helped Alekhine to pursue his chess career. Just 15 years old, he partizipated 1908 in the international tournament in Düsseldorf/Germany and came fourth and fifth place. Shortly after the tournament he played a match against the german chessmaster Curt von Bardeleben and won clearly with 4,5-0,5 points. In 1909 he achieved the titel of chessmaster winning the Russian Championship in Sankt Petersburg. At this time there were still other players who were stronger than Alekhine. In the same year Alekhine lost a match in Moskau against chessmaster Nenarokow 0-3. 1912 Alekhine moved to St. Petersburg to study law until 1914, but partizipated on all chess events at the same time. 1913/1914 he tied for first place with Aaron Nimzowitsch in the All-Russian Masters Tournament. In May 1914 he came third behind world champion Lasker and future world champion Capablanca in another very strong masters tournament held in St. Petersburg and achieved the title of Chess Grandmaster. In August 1914 Alekhine was leading the international Masters Tournament in Mannheim / Germany when the first world war broke out. 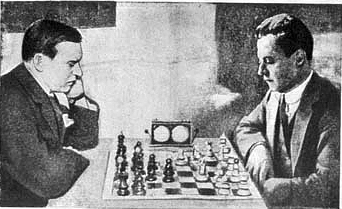 The tournament was interrupted and declared to be finished and Alekhine was proclaimed as the winner. All players coming from enemy countries were arrested. Among them were all russian players like Alekhine, Efim Bogoljubow, Alexei Selesnjow, Ilja Rabinowitsch and others. They were interned in Rastatt/Germany. In September 1914 Alekhine was freed and returned home to Moscow. He married the russian artist Anna von Sewergin with whom he had a daughter. He raised money giving simultaneous exhibitions to support the russian chess players who were still held in custody in Germany. In August 1916 he served for the Red Cross in the russian army and received the St.-Georgs-Decoration and the St.-Stanislaw-Decoration for his bravery saving the wounded. Finally he was wounded himself badly and had to spent a few month in a military hospital in Ternopil. In 1919 he was arrested, put into Odessa's death cell and sentenced to death. He was held for a spy. But soon he was released as he was recognized being a famous chess player. Some say that the revolutionist Trotzki himself had visited Alekhine in his cell and had played chess with him. After that he was freed. Alexander Alekhine returned to Moscow and found a job as an investigating judge from May 1920 until February 1921 and worked as a interpreter as he was fluent in German, French and English. In 1920 he won the first championship in the Sowjetunion, the All-Russian Championship in Moscow. As he saw no future for himself in Russia he migrated 1921 to West Germany / Berlin but moved soon to Paris / France and never returned to Russia again. From now on Alekhine had only one goal, to beat Capablanca and to become world chess champion. The following six years he worked to develop his chess skills and took part successfully in various tournaments. In 1927 a match was arranged with Capablanca in Buenos Aires /Argentine. Capablanca was held as the favorit but Alekhine was better prepared. Alekhine won the match surprisingly after 34 games 6-3, 25 draws (draws didn't count). The winner was the one, who achieved six victories. Alexander Alekhine promised Capablanca a return match but this match never came to pass. Alekhine was afraid of Capablanca and avoided to play in the same tournaments with him. Finally they met again 1936 in the tournament in Nottingham. Alexander Alekhine defended his title 1929 and 1934 playing the FIDE-World Champion Efim Bogoljubow who was the official challenger. Bogoljubow won 1928 and 1929 two official FIDE-World Championships against Max Euwe and had to play Alekhine. The FIDE (World Chess Federation) was founded in Paris in July 1924 (Federation Internationale des Echecs, known as FIDE). But Alekhine never returned his title to the FIDE. In 1929 Alekhine has beaten Bogoljubow clearly (15,5-9,5) and in 1934 (15,5-10,5). After that the FIDE gave up to award official world championship titles until after Alekhine's death 1946 in Portugal.